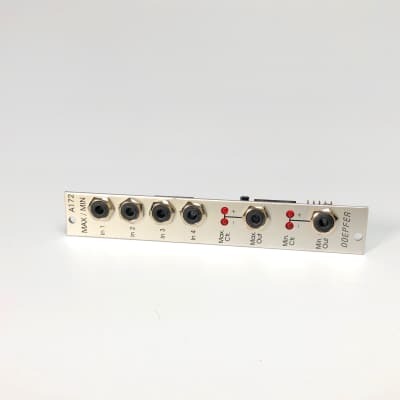 A-172 is a minimum/maximum selector module equipped with four analog inputs and two analog outputs (minimum, maximum). The module permanently picks the maximum and minimum voltages out of the four input signals and outputs these voltages to the maximum and minimum sockets. The main application of the A-172 is the processing/mixing of control voltages e.g. random voltages, ADSR, LFO, S&H, Ribbon CV, Theremin CV and similar. The module can also be used for audio signal processing e.g. several outputs of the same or different VCOs. It may be necessary to adjust the input signals independently to bring them into the correct range for use with the A-172. To adjust the offset and amplitude for each input it is recommended to to use an offset/slew limiter/attenuator. If only one CV source is connected this module can be used to check polarity and strength of the incoming signal since the brightness of the LED is proportional to CV. Further, if only one input signal is connected then the Max and Min out sockets can be used as a buffered multiple.